I’m super excited; I should have this live in a few days time. 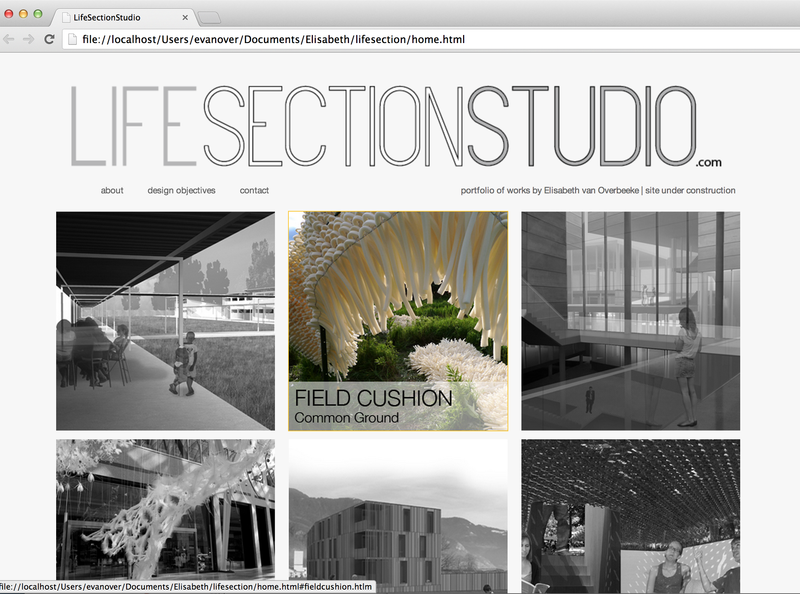 A website for my design work has been a long time in coming. I designed it and wrote the code for it myself. :D The upcoming conference was a really good motivator to finally get it done. There is still a lot of work left to do because the pages with project details do not yet exist, but I am happy enough putting this page up and then slowly but surely filling in the gaps. Some of you may know that my job since April has been planning the ACADIA conference that is being hosted by Waterloo Architecture this year. 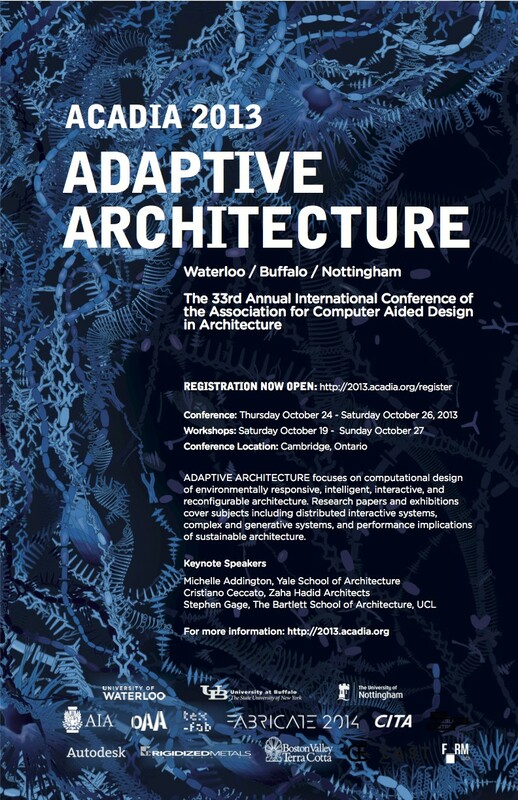 ACADIA stands for the Association for Computer Aided Design In Architecture and it is one of the oldest associations that gathers this kind of architectural research. The Conference is just one week away now and everything is slowly coming together. It was very difficult to let go of “my baby” and move to part-time when I started school in September. It is nice to be working on my own stuff again though. There is an incredible team invested in the event and I’m excited for the opportunities it will hopefully bring to the school. Even though it isn’t exactly related to the work I’m doing for my thesis, it is still a great networking opportunity. I know the research work so well from communicating with all the authors and pushing forward the handful of publications that will accompany the event. My job has been as general manager involving a wide range of tasks, from arranging catering and hotels to author communications, to paper editing and publications production, to website development and promotions, and the list goes on! 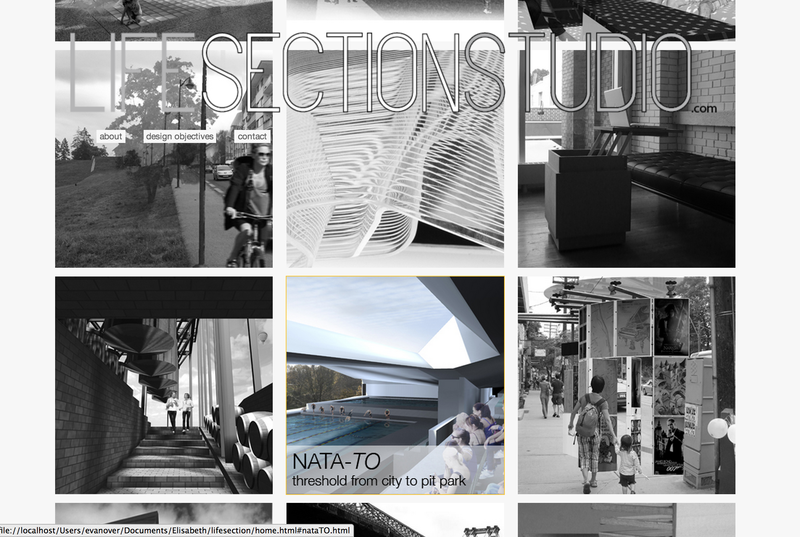 Even though I’ve missed doing architectural design work as a job, it has been interesting to get glimpse into the domains of website and publications in particular. Working with the ACADIA website has given me the confidence to create my own website for my design portfolio which I hope to have a first version up before Christmas! Anyways, if you are at all remotely interested in this kind of research, I totally recommend you come to the conference or at least check out the research abstracts that will soon be online. All information can be found on the website: http://2013.acadia.org. The next step of my thesis work has involved a large amount of research about related precedents, and then a process of analyzing two of them through a series of diagrams that pull out and highlight relevant relationships that could benefit my own work. The two precedents that I looked at were several community engagement and data gathering app interfaces, as well as the methodologies of an architectural and urban design and research office called Chora. Looking at apps was helpful to get a sense of how people can use technology to collect information and interact and engage with a community, and also gave me a better understanding of the relationships that can exist within the interfaces. What would normally be a very spatial interaction (give and take) in the physical world, becomes nothing but a network link (input and output) in the virtual world. Yet, it is a connection all the same and will eventually have an impact on what does happen in the physical world. Studying Chora’s work was beneficial because the office, similar to my own ideas, tackles regional issues through a method of game play. They first collect a database in a framed area wherein they track processes described in mini scenarios at randomly chosen points or “beansites” in the area as well as map larger processes and flows. 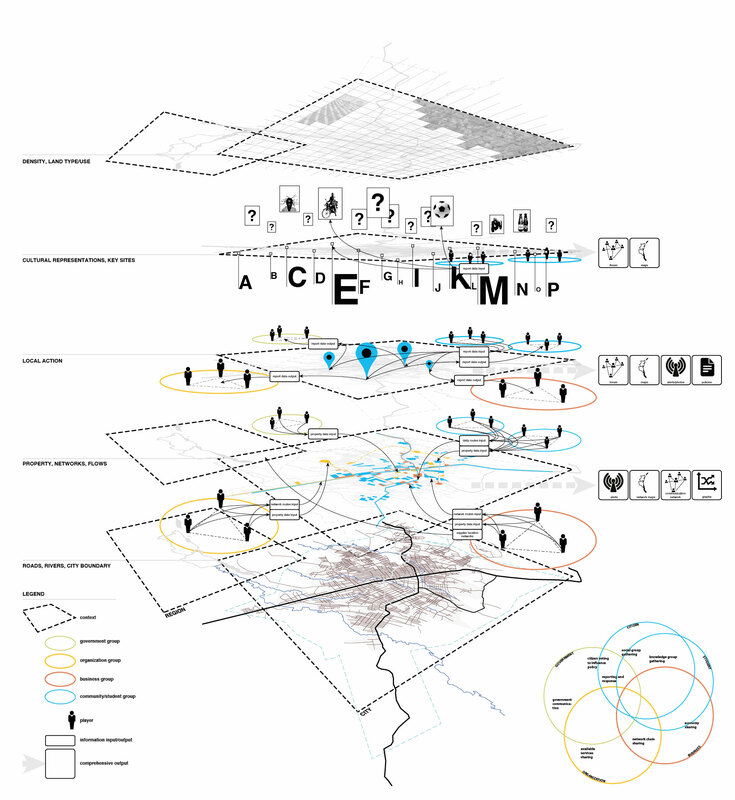 Next they establish prototypes that are proposals for new concepts that increase efficiency of the current processes and act as “instruments of new urban form”. After this they create scenario games that test the conditions of the prototypes, and lastly they develop Action Plans that outline the procedure of implementation of the prototypes . Chora’s methodologies were helpful but in my opinion, shallow. The theory sounds comprehensive, but I couldn’t find any real examples of how it was applied and how the nitty gritty details resolved themselves. How does Chora collect their data? What is an example of one of their detailed prototypes? What are the specific rules of their scenario games and how do they program their charettes? Who are the participants and players in these games? These are all questions that I haven’t yet found answers to. What Chora’s methodologies did help me with was how I could pull apart the different processes of a city into different layers in order to better understand how different “players” could influence and engage with each one if each were perhaps a layer in a larger interface or game board that was Beni and perhaps even the region. In this way I was able to apply the analysis that I made of each of these precedents and apply it to the development of my own ideas.